Don’t you just love everything mini? Especially when it’s bright and fun colors! 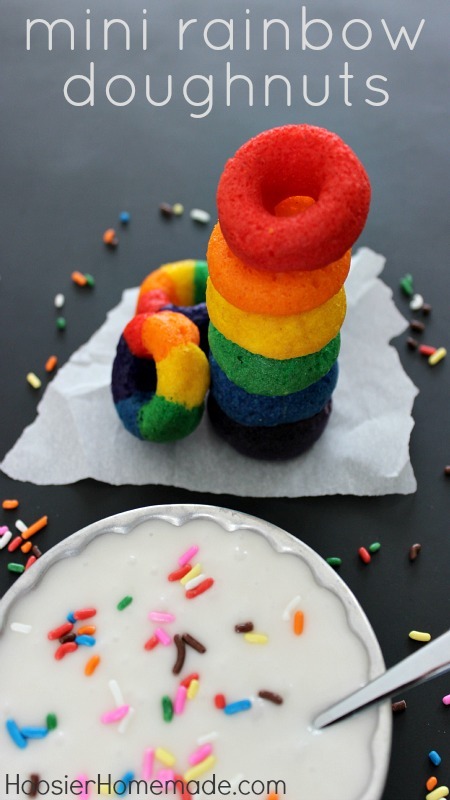 Rainbow Week continues today with these yummy Mini Rainbow Doughnuts…and guess what? They are super easy too! 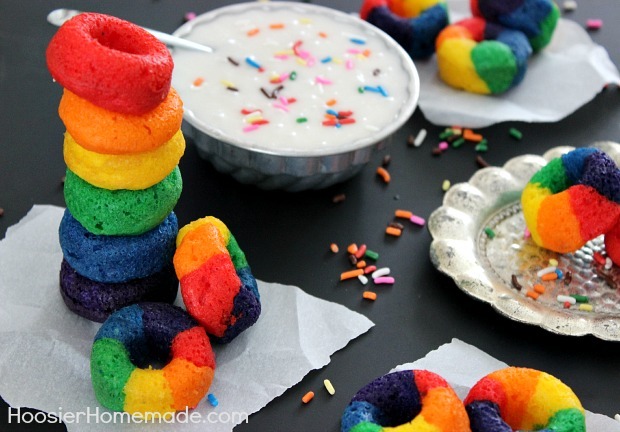 I love these mini rainbow donuts- they are perfect for Unicorn parties, rainbow parties, St. Patrick’s Day- any fun celebration! 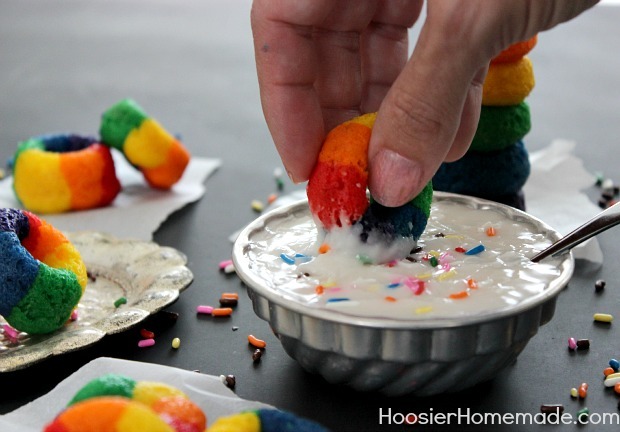 These little bites of sunshine start with a cake mix and with only 3 more ingredients plus the bright coloring, you have Mini Rainbow Doughnuts done in a flash! This recipe makes fluffy, baked doughnuts like the Cinnamon Roll Doughnuts I shared. 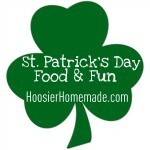 It’s a quick recipe to put together on the weekends, even if you don’t add the coloring. Wouldn’t these make a fun breakfast to start off a birthday celebration? Or maybe when the kids have a sleep over? 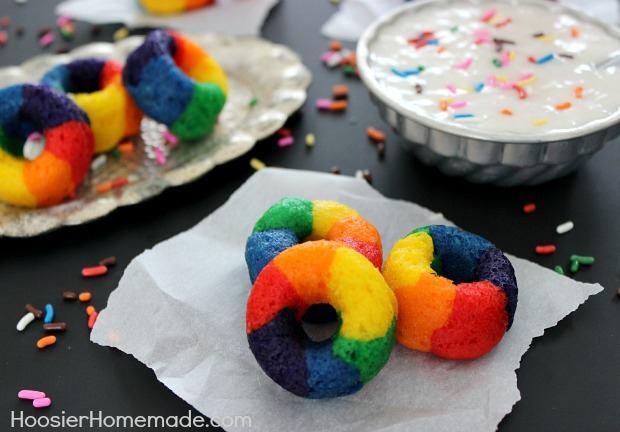 After mixing the doughnut batter, divide it into 6 separate bowls and add the coloring. Then place the batter in resealable bags, you could also use decorator frosting bags, but it’s a little less expensive this way. Then just pipe a very small amount of batter into the Doughnut Pan. I added the purple and then the yellow on the opposite side, then filled in with the other colors. 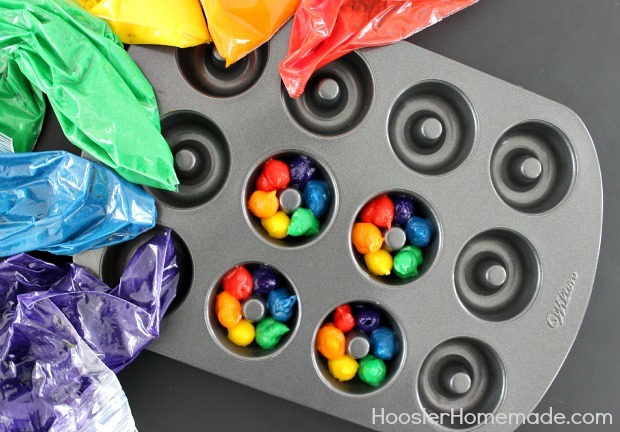 You can also make them a single color and then stack them…definitely fun too! Whip up a little glaze with powdered sugar, milk and vanilla for dipping these little babies in! 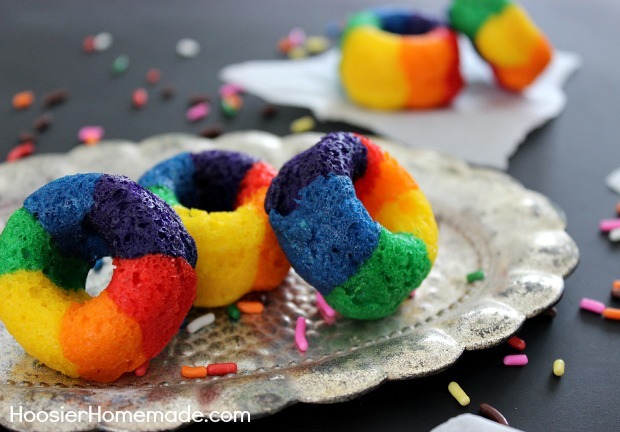 You can also leave out the coloring, this recipe makes a great fluffy, baked doughnut. Hi Joslynn, no just follow my directions with the ingredients listed for the doughnuts. these look fab, would love to make them with my daughter but were over in the uk and i have no idea which brand mix to use help!!! Hi Rachel, I’m not sure what kind of cake mix you have there, if any. But any kind will work, vanilla or yellow are best. If you don’t have cake mixes, you can certainly make any white cake from scratch, divide the batter and color it. Thank you so much for the info and great ideas! I have the mini-doughnut pan but wasn’t really excited about filling them — I could see a mess on a horizon. Your way is so simple and flawless! Your recipe sounds great! I think I’m going to take your rainbow idea and make them pastel for Easter treats. Thank you so much for sharing your ideas!! I’m inspired!!! What brand of coloring did you use to get the vibrant colors? Hi Kathy, I use Wilton gel paste for coloring. I have that pan and I can never get my donuts to look that nice haha. Love the colors! Thanks Angie! I found that just a very small amount of batter works best. I had lots that didn’t look so good. Darling, as usual you come up with the cutiest things. Oh thanks so much Phyllis! I’m thrilled you like my ideas! These are TOO CUTE! My kids would love them. Thanks for stopping by Kim! 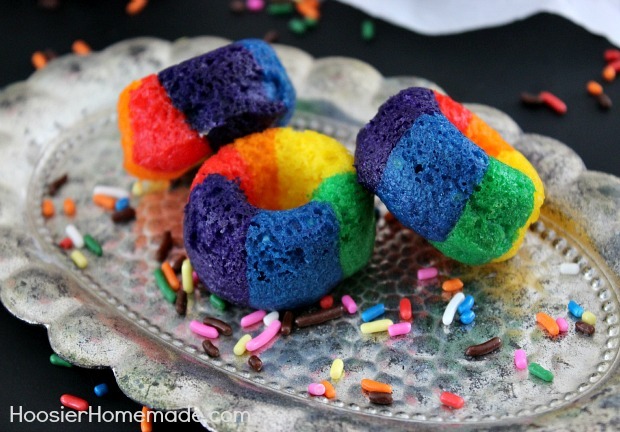 So glad you like the rainbow doughnuts! I have just retired &your website looks so cute. I love to cook & fix different little snacks.thank u so much. Welcome Dianne! I’m excited you found me! 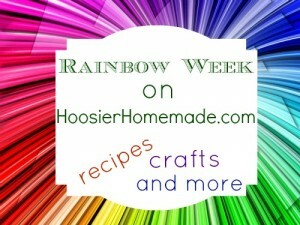 I am obsessed with rainbow everything, and you know these are going directly onto my rainbow pinterest board! So fun and colorful! 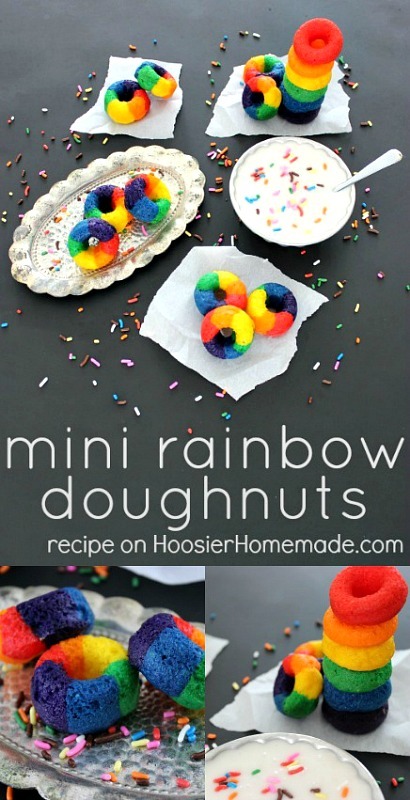 So glad you like the Mini Rainbow Doughnuts, Elizabeth! Thanks for stopping by! Oh my gosh they look just like giant fruit loops! That’s funny, Erin! I guess they do look like fruit loops! Hi there, you need a boxed cake mix either a yellow cake mix or a Golden Butter cake mix.